It's important to secure hand quilting stitches with a knot when you begin to quilt and again when you've reached the end of each length of quilting thread. Securing the stitches will keep them from unraveling. It's usually best to start quilting with no more than 20 inches of thread in the needle. Longer lengths make the thread more likely to become twisted or unruly at some point during the quilting process. Many quilters like to load several needles with thread before beginning so they can just grab a new duo when the first length runs out. 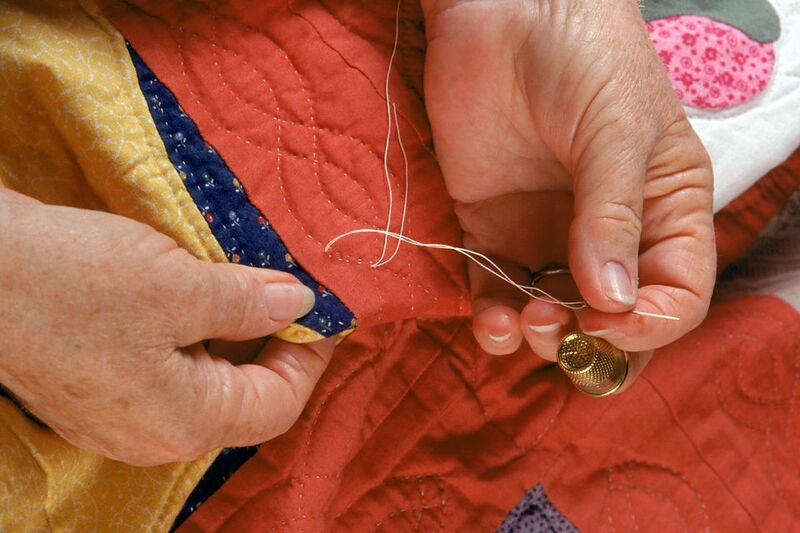 Hand quilting with specific needles, also called betweens, involve short, very sturdy hand sewing needles that don't typically bend or break. Choose a size that's comfortable for you, and explore different brands—some have larger eyes than others and are easier to thread. It's much easier to thread betweens with a needle threader, but some threaders are too bulky for hand sewing needles. Look for devices that mention the ability to load thread into small eyes. The tiniest betweens are size 12, and many expert quilters feel they help produce the smallest stitches, but start with a size that is comfortable to work with. If a needle is difficult to handle, your stitches might suffer. Tiny stitches aren't nearly as important as the consistently-spaced stitches you'll achieve when a needle feels "right." Place the length of thread through the eye of the needle, and make a quilter's knot at the end of the thread. Clip excess thread if necessary. To begin a line of stitches, slide the needle into the quilt sandwich about 1/2 to 1 inch or so from where you plan to take the first stitch. Allow the needle and thread to move through the quilt top and the batting and bring it up through the quilt top where stitches will start. The needle should not pierce the quilt's backing. Pull the needle and thread until the knot is stopped by the fabric on top of the quilt. Wrap your fingers around the thread 2 to 3 inches from the knot and give the thread a slight tug. The knot should move into the quilt sandwich. Do not take an actual stitch. If you tug too hard, the knot might travel through the quilt top. Don't worry; that's not unusual. Just repeat the process and don't tug quite as hard the second time. End a line of hand quilting stitches in a similar way. Take the needle and thread through all layers to the back side of the quilt (or through the top again). Create a loop with the thread and run the needle through the loop to form a knot—you can hold the thread against the backing when creating the loop/knot. You could also create another quilter's knot by wrapping the thread around the needle and pulling it toward the quilt top as you pull the needle in the opposite direction. Tug to take the thread into the sandwich again, making sure it moves through the quilt's batting. Some quilters end a line of quilting by bringing the needle up through a seam line, taking a few backstitches into the middle of the seam (where they won't be noticed) to secure the thread. There are many variations of quilting start and stop instructions, and you'll discover your own best methods as you practice hand quilting skills.